23 year old Ekaterina Plekhovm from St. Petersburg, Russia was crowned as the new Miss Intercontinental 2013, the 42nd title which was held on December 14 at the Maritim Hall, Maritim Hotel Magdeburg in Magdeburg, Germany. She was crowned by the outgoing titleholder, Daniela Chalbaud from Venezuela. Aside from the coveted crown, Ekaterina won a cash prize of $15,000 and an additional contract for her reigning year by MGO, managed by MGO Germany with a monthly salary of $1500 plus Travel Trips within the year. 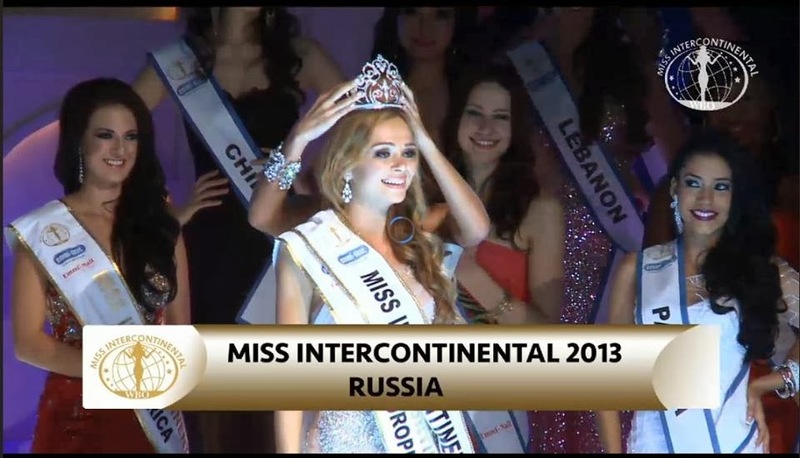 Plekhovm was also given the title of Miss Intercontinental Europe. The 1st runner up and crowned Miss Intercontinental North America was Puerto Rico, Aleyda Ortiz. She will receive a prize of $3,000 plus a voucher of Lacomed for treatments worth $5,000 US. Miss Intercontinental South America and also placed 2nd runner up is Margarita Peralta from Colombia won $1,000 cash. Philippines' Koreen Medina (Miss Intercontinental Asia & Oceania) and South Africa's Kayla Nel (Miss Intercontinental Africa) both won $1,000 for placing the 3rd and 4th runners-up respectively.